To get help use our feed­back form to contact us. Here we will see a few poker games that are available play poker from your pc, mac or mobile and offline. Telsina differs from traditional stud poker because each player has 6 cards in their hand and not 5 in stud. Each player is dealt 1 face down card. The community cards are dealt to the center of the table. Following this there are 4 cards dealt face up to each player. In Telsina, the cards with a face value of 2 and 6 are removed from the deck before play commences. A Telsina table is limited to 6 players. This is a variant of Texas Hold’em. The difference is that instead of 2 cards being dealt face downward to each player, 3 are dealt face down. The betting continues and before the flop each player discards 1 card. This follows similar rules to the variant Pineapple but with one major difference. After the initial betting has been completed, then a single card is discarded by each player. This too is similar to Pineapple. The major difference is that there is no discard after the initial betting. Each player retains all 6 cards. This gives the player a greater chance of creating a winning hand by using a combination of 5 of the 6 cards they hold. This variant is not very popular with players because it is played with three separate hands at the same time. 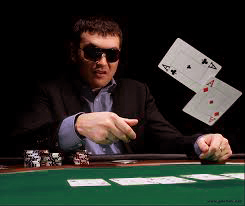 A player has to bet on each hand independently and the cards within each hand are not interchangeable. This means that a player has to use three times the amount of chips for each game to create a winning hand. This game is played in the same manner as normal poker. The variant for this game is that the 8, 9 and 10 valued cards have been removed from the deck before play starts. It then follows the normal rules of poker. Badougi has at least 3 other names. These are Badugi, Padooki or Paduki, but they all played using the same rules. The game is played with only a 4 card hand. These 4 cards are dealt face down to each player before the flop. Each player is then given the chance to change any cards in their hand, up to a maximum of 4. The outcome of the game is that the player with lowest score takes the pot. In the case of a draw, the pot is split equally between the winning players.